In order to free up space in your email profile you can delete messages that you do not need anymore, but if you still need to be able to access these messages for future reference, you can archive items instead (Messages/Folders, Contacts, Calendars, etc.). Archiving removes items from your mailbox on the server and saves them locally on your computer in a separate email (.pst) file. This means that you will only have access to these items on a computer with these archive .PST files, and if these files get deleted or corrupted, they will be gone forever. If you cannot afford to risk losing this data, take a backup of these files. 2. In the popup window, make sure the second bullet for Archive this folder and all subfolders: is selected. Click on the folder you would like to archive. You can select the entire Inbox, subfolders within the Inbox, the Deleted Items folder, Sent Items, Calendars, or any other items in the list. 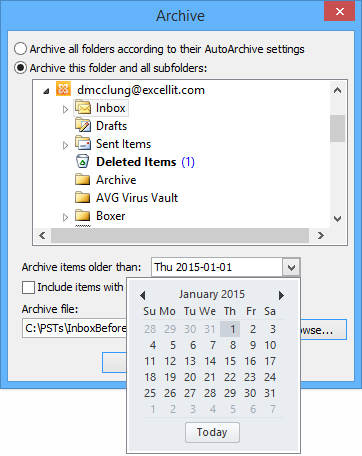 Once you have selected the folder you want to archive, click on the Archive items older than: dropdown menu to choose the date from which you want to archive. For example, if you want to archive all items from the previous year, you would select January 1. 3. By default, the Archive file name will be archive.pst. If you are archiving multiple items, this can get confusing so you may want to change the file name to something more descriptive such as InboxBefore2015.pst. 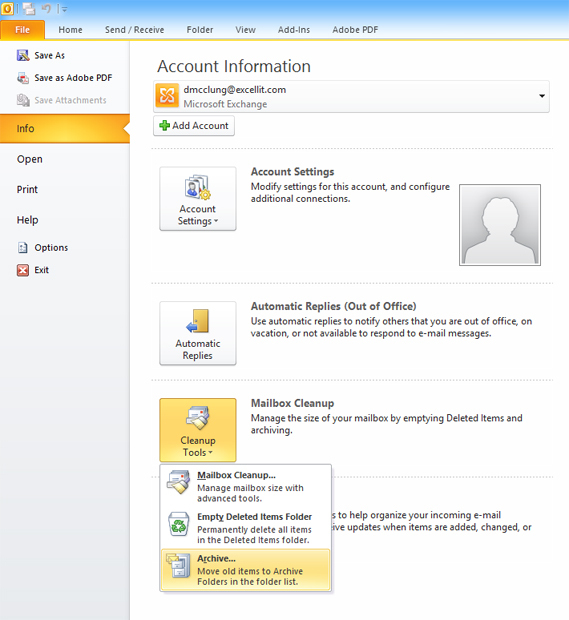 Click OK and Outlook will begin archiving the selected folder. You can use Outlook while this is happening, and you can see the progress in the bottom right corner of the program. Once it has completed, you can follow these steps to archive another folder.